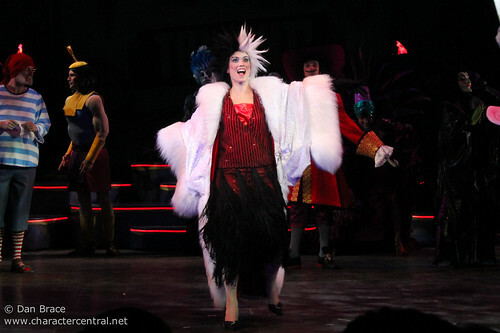 Cruella de Vil is the dog-snatching villain from the 1961 movie 101 Dalmatians. Living in Hell Hall, Cruella is a wealthy heiress who loves fur coats so much that her mean and selfish streaks make her want the softest, most expensive coats around. When visiting an old school “friend”, Cruella discovers that she owns fifteen brand new Dalmatian puppies. Determined to see her coat finished, she offers a large sum of money to purchase the puppies, but is refused. Cruella then takes it upon herself to acquire the puppies by hiring the bumbling Jasper and Horace to steal them. The dogs are locked up at Hell Hall with 84 others that have been stolen or purchased by Cruella. 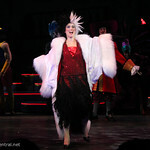 Cruella learns that the police may be on to her and orders her henchmen to start the process to make the coats. Before they can kill the puppies though, the dogs manage to escape with the help of some other local animals. They are pursued by a raging Cruella. Without realising Jasper and Horace are also on the trail, and just as Cruella nearly succeeds getting the dogs back, she collides with them, and they end up in a wreck. Just because she was foiled once by the Dalmatians, Cruella was not swayed from her dog-snatching ways, and still continues to pursue her dreams of owning the most luxurious fur coat in the world – at whatever cost. 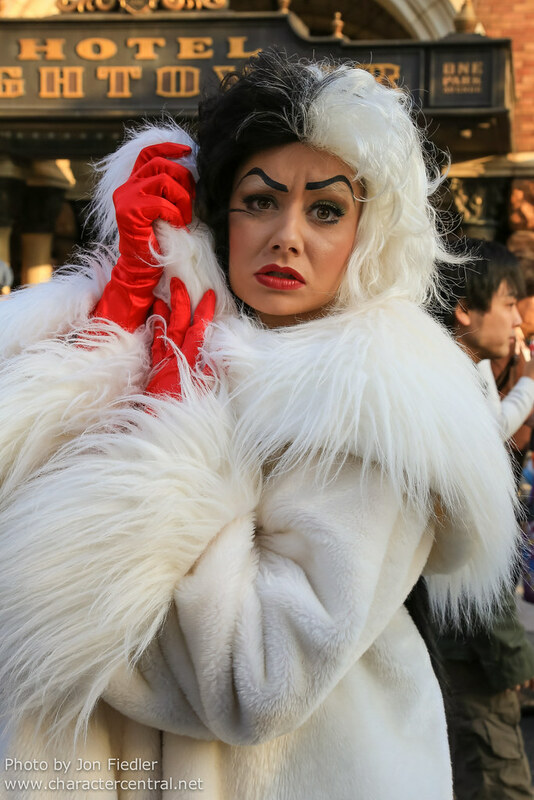 Cruella can regularly be found meeting her fans on Main Street USA in Disneyland. She may appear during the Halloween parties at the Magic Kingdom, but that is changeable. In Paris she can sometimes be found at Halloween during the villains greeting. 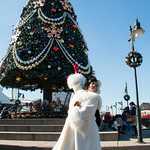 In Tokyo she is out regularly in American Waterfront.